The weather has been moody and indecisive for a week or so. Cooler than normal, cloudy/sunny/showers. It just can't make up it's mind. 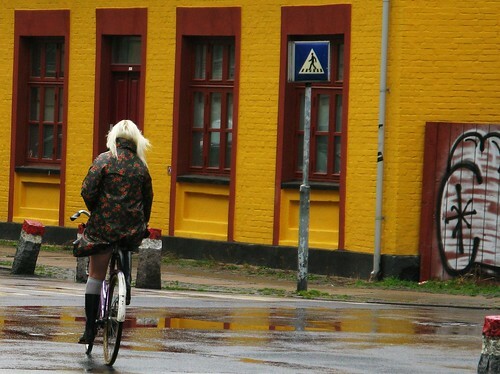 This might be considered a nightmare from a cycle chic point of view, but Copenhageners seem to adapt well. A stylish rain coat does the trick and if your toes are prone to getting chilly, stockings in boots. This is a classic example of Ready For Anything Cycle Chic. Elegant up top, water resistant pants for the drizzle and toasty warm boots. Who's to say that some stylish shoes aren't hidden in her basket for when she arrives at her destination. With all that said, we're so very pleased that summer is returning tomorrow and we're looking forward to the beach. Here's yours truly trying out my new Long John from Velorbis - the grandaddy of all cargo bikes in a shiny new version. My boy on the back and two friends on a cushion in the cargo rack. What a lovely ride. I'm heading out today to buy wood so I can build a box for my kids to sit in and lean against. I'll let you know how it goes. I remember being driven around in the front of an old boyfriend's long john. It was carnival in Copenhagen and I had such fun watching it all from slightly below. What good times!!! Wow. I love the long John. Lets us know how the trip went. I am wishing for cooler weather. It has been hot here! Those two little boys are just too much! Soooo cute. Makes me want to be outside playing! Stylish and practical, I love it! It looks a bit dangerous riding on front of the bike like that... is it hard to drive it with two squirmy kids on the front? thanks, everyone. the long john is, indeed, a cool ride. a real low rider when sitting in the cargo area. porter hovey... there are actually three boys! even better. krista: it's only dangerous if you ride stupid. which I don't. :-) Squirmy kids aren't a problem. When they squirmed, i just wobbled the handlebars to REALLY make it wobbly and they promptly held on tight. Helmets are personal choice. We don't wear helmets and we certainly don't go around telling people to do so. It's none of our business what people wear. And since there is no conclusive scientific evidence that helmets save lives or prevent brain damage, I don't see any need. I believe that good parenting is teaching my children to ask questions and seek answers. I think people should teach their children to cycle properly and safely instead of chucking a safety blanket around them. The odds that your brother's life actually WAS saved by a helmet are very slim, simply because helmets are designed to do that. The A helmet saved my life! Myth. Tro eller viden. det er dit valg. Either way it looks like fun. The Long John is the original. I like the fact that the design is almost unchanged over the past seven or so decades. My Dad rode one in the 1940's as a messenger boy here in Copenhagen. 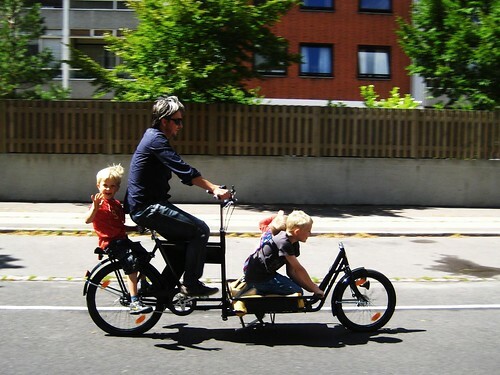 Plus, it's Danish and the Bakfiets is just a Longjohn copy with a box. I like the original. :-) Plus, it's fun building a box. Plus, nobody rides Bakfiets here. A good reason? as someone who owns both bikes, and a Sorte Jernhest trike, the Long John gets the most use, both from my family and friends, followed by the trike. The poor bakfiets sits around- unused- it has now been dedicated to the dirty jobs (Moving trash and lawn refuse). We have also found that the Long John has a nicer finish and is built with better cycle parts- so less maintenance, and gets a lot more smiles. It also has a lower center of gravity so it is a lot more stable, especially with kids! Thanks for that. I'm even more pleased that I chose the Long John. I do intend to teach my children to be aware in traffic but I have no power over other people in traffic, pebble on the road etc., and this is the fact which makes me spend a few bucks on a thing which may or may not save my live or that of my children. I also use the safety belt in the car although I have never had to "use" it. You can't compare a seat belt in a car with a bike helmet. The seatbelt is an effective piece of safety equipment with many years of scientific proof behind it. the bike helmet isn't designed to save lives or protect against head injuries. But the important thing, Bettina, is that you feel safe on the bike lanes. Helmets are personal choice and you have made yours. Just please please please don't make the mistake of believing it will save your life or protect you from brain injury. There is a whole area of scientific research about how 'risk compensation' gives people a false sense of security and increases the risk of accident. Sure, it's different out there than here in Copenhagen on the bike lanes. But seriously, have an honest look at the Cykelhjelm.org website. It's merely there to give a balanced debate here in Denmark.